We were brought to tears by the hauntingly beautiful “We Are Strong: The Faces of Hope,” written by Malky Storch, Bracha Goldstein and Miriam Storch. They sang the song to their beloved sister, Hudis, as she lay dying. It was sung publicly for the first time by 8th Day at the Gala. The Gala also gave us the opportunity to thank Dr. Michael Apkon and SickKids Hospital in Toronto for the partnership that enables us to bring Chai Lifeline services to children and families in Canada’s premiere children’s health institution. Dr. Apkon received the Maimonides Medical Achievement Award. 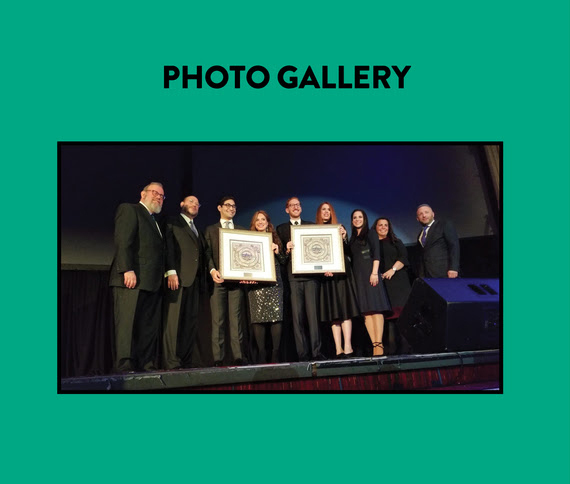 Shira Konski and Scott Moerdler and Miriam and DJ Elefant received the Camp Simcha Appreciation Award for their leadership in the Alumni Association and their ongoing contributions to Chai Lifeline. Drs. Tammy and Hillel Bryk were given the Chai Heritage Award for their 24/365 devotion to Chai Lifeline and their extraordinary efforts to raise funds and awareness through their participation in Tour de Simcha and Team Lifeline. If you missed the Gala, or you just want to relive the best moments, take a look at the photo gallery and the honoree videos. You can also view the journal and redeem your pledge or make a donation. This entry was posted in Newsroom, Volunteers and Supporters and tagged Camp Simcha, Chai LIfeline, childhood illness, family services, inclusion, non-profit, pediatric cancer, services for sick children, sick kids, voluntarism, volunteers by Chai Lifeline. Bookmark the permalink.